The object of craps is to predict the outcome of a roll or sequence of rolls of a pair of dice. 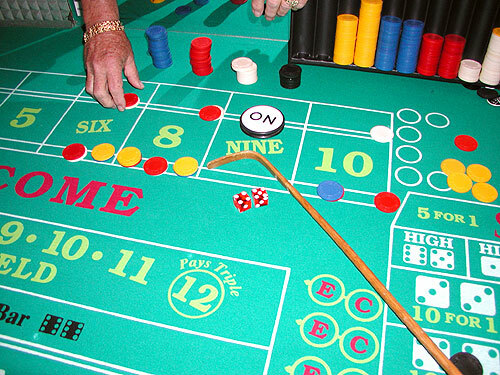 Craps is also one of the most fun games on the casino floor. If you have ever been to Vegas you have probably noticed a group of people gathered around a craps table having the time of their lives, but were afraid to join in because you didn’t understand the game. Probably, the most intimidating part of craps is the table itself. You look down at all those choices; Pass Line, Don’t Pass Line, Big 6 or 8, Come Bets, Don’t Come Bets, Field Bets, Hardway Bets and a dozen or so other exotic wagers. You feel in over your head before you even get your money out. Now, I am going to make it very simple for you because we only care about the Pass Line, the most basic and common bet at the craps table. All those other ‘exotic’ wagers are simply there to distract you and take your money and should be completely ignored. That already sounds less intimidating, looking down at the craps table now you know the only bet that matters is the Pass Line and everything else can be ignored. Pass Line Bets: The most basic and popular bet at the craps table offering a low house edge of only 1%. A wager on the Pass Line wins if the first roll of the dice after the wager is placed (the Come Out Roll) is a 7 or 11 and loses if the 2, 3 or 12 (craps) is rolled first. If a 4, 5, 6, 8, 9 or 10 is rolled, that number becomes the Point and all Pass Line wagers remain where they are. For the Pass Line wager to win once the Point is established, the shooter must repeat the Point roll before a 7 is rolled. The shooter continues to roll until the Point is made and the Pass Line wagers win or the shooter rolls a 7 and all Pass Line wagers lose. All other rolls are ignored; only a repeat of the Point roll or a 7 matter to Pass Line wagers once the Point is established. Winning bets are paid even money. Don’t Pass Bets: This bet is the opposite of the Pass Line bet. This bet wins if the shooter rolls a 2 or 3 on the Come Out Roll and loses immediately if the Come Out Roll is a 7 or 11. If a 12 is rolled, it’s a tie, the wager is returned to the player and play continues (usually the wager will be left on the tables Don’t Pass spot for the next roll but may be picked up or moved by the player before the next roll). Once the Point is established, this bet wins if the shooter rolls a 7 before repeating the Point roll. Just like Pass Line wagers, once the Point is established the bet is locked in and cannot be removed or altered until play is over. Play is over when the shooter rolls 7, a win for a Don’t Pass wager, and is lost if the shooter repeats the Point before rolling a 7. Winning bets are paid even money. Come Bets: A Come Bet wager may be placed anytime after the point has been established on the Come Out Roll. Once the Point has been established the rules for this bet are the same as the Pass Line bet. If a Come Bet is placed before the Point (4, 5, 6, 8, 9 or 10) is established the dealer will move the wager from the Come area to the corresponding numbered box when a valid Point number is rolled. Come Bets are exempt from winning or losing on the Come Out Roll when a 7, 11, 2, 3 or 12 is rolled and will be left in the Come area until the Point is established. Just like Pass Line wagers, once the point is established the bet is locked in and cannot be removed or altered until play is over. Play is over when the shooter repeats the Point, a win for a Come Bet wager, or rolls the losing 7 before the point is repeated. Winning bets are paid even money. Don’t Come Bets: This bet is the opposite of the Come Bet wager. It may be placed anytime after the Point has been established on the Come Out Roll. Once the Point has been established the rules for this bet are the same as the Don’t Pass bet. If a Don’t Come Bet is placed before the Point (4, 5, 6, 8, 9 or 10) is established the dealer will move the wager from the Don’t Come area to the corresponding numbered box when a valid Point number is rolled. Don’t Come Bets are exempt from winning or losing on the Come Out Roll when a 7, 11, 2, 3 or 12 is rolled and will be left in the Don’t Come area until the Point is established. Just like Pass Line wagers, once the point is established the bet is locked in and cannot be removed or altered until play is over. Play is over when the shooter rolls a 7, a win for a Don’t Come Bet, and is lost if the shooter repeats the Point before rolling a 7. Winning bets are paid even money. Place Bet to Win: A wager can be placed anytime (between rolls) on numbers 4, 5, 6, 8, 9 or 10. The wager wins if the place number is rolled before a 7; otherwise it loses. Winning bets are paid 9 to 5 for 4 and 10 place wagers, 7 to 5 on 5 and 9 place wagers, and 7 to 6 on 6 and 8 place wagers. Place Bet to Lose: The opposite of Place Bet to Win. The wager wins if a 7 is rolled before the place number; otherwise it loses. Winning bets are paid 5 to 11 for 4 and 10 place wagers, 4 to 5 on 5 and 9 place wagers, and 5 to 8 on 6 and 8 place wagers. Hardway Bets: Whenever a shooter rolls doubles and the outcome is a 4, 6, 8 or 10, the shooter is said to have hit the number the ‘hard way’, that is, by rolling doubles. If 4, 6, 8 or 10 are rolled and the outcome is not doubles, the shooter is said to have hit the number the ‘easy way’. Example: The shooter rolls a pair of 3’s and has a Hard 6 or 6 the Hardway. The shooter rolls a 4 and 2 and has an Easy 6 or 6 the Easyway. The Hardway bet wins when the shooter rolls a 4, 6, 8 or 10 with doubles or the Hardway. The Hardway bet loses if a 4, 6, 8 or 10 is rolled without doubles or the Easyway. The Hardway bet also loses if the shooter rolls a 7. Winning Hardway bets on 4 or 10 pay 7 to 1 and winning hardway 6 and 8 bets pay 9 to 1. One Roll Bets: These are wagers on the outcome of a single roll of the dice. The player immediately loses or wins depending on the next roll of the dice. Field: A wager that the next roll will be a 2, 3, 4, 9, 10, 11 or 12. Pays even money except the 2 and 12 pay double. Any Craps: A wager that the next roll will be a 2, 3 or 12. Pays 7 to 1. Any Seven: A wager that the next roll will be a 7. Pays 4 to 1. Three Eleven: Betting on either number, this is a wager that the next roll will be a 3 or 11. Pays 15 to 1. Two Twelve: Betting on either number, this is a wager that the next roll will be a 2 or 12. Pays 30 to 1. Eleven: A wager that the next roll will be an 11. Pays 7 to 1. Horn: A four way bet that requires four chips. Wagering on the next roll to be a 2, 3, 11 or 12. Pays 30 to 1 for the 2 or 12 and pays 15 to 1 for the 3 or 11. Supplementary Bet after Pass Line Bet: If the player makes a Pass Line Bet and a total of 4, 5, 6, 8, 9 or 10 is thrown on the Come Out Roll, the player has the right to make a Supplementary wager (called Laying Odds) in support of the original Pass Line bet in any amount up to the maximum the table allows. There is a huge variation in what multiple of odds is allowed from table to table and from casino to casino. Some casinos will only allow a maximum of 2 times your Pass Line wager up to a maximum of 100 times your Pass Line wager at some casinos. The maximum odds allowed should be clearly marked on the table rules plaque. For example, if the maximum odds wager allowed for the table is 20X and you place a Pass Line wager of $5 and the shooter rolls a Point number, then you can place an odds bet of $1, $2, $3, $4… up to $100 placed directly behind your pass line wager on the table. If the point is met before a 7 is rolled you win your original Pass Line wager plus the Supplementary wager is paid out as follows. Winning Supplementary Pass Line bets are paid 2 to 1 on 4 and 10 Point wagers, 3 to 2 on 5 and 9 Point wagers, and 6 to 5 on 6 and 8 Point wagers. This beneficial for the player pay out schedule is what makes laying odds the best bet in the casino with a 0% house advantage. It is, however, very easy to lose control of your money management strategy when you lay the Odds or Supplement your bet and an extra effort to not get caught up in the ‘action’ is required. Supplementary Bet after Don’t Pass Bet: Works the same as the Supplementary Bet after Pass Line Bet but you win when the point is not made before the 7 is rolled. The pay out schedule for winning Don’t Pass Supplementary Bets is 1 to 2 on 4 and 10 Point wagers, 2 to 3 on 5 and 9 Point wagers, and 5 to 6 if the Come Out Point was 6 or 8. Supplementary Bet after Come Bet: If the player makes a Come Bet and a total of 4, 5, 6, 8, 9 or 10 is thrown on the roll immediately following the placement of the Come Bet, the player has the right to make a Supplementary wager in support of the Come Bet. The Supplementary bet can be any amount up to the allowable limit as set by the table rules just like the Supplementary Bet after Pass Line Bet. The pay out schedule for winning Supplementary Come Bets is the same as for Supplementary Pass Line bets. Supplementary Bet after Don’t Come Bet: If the player makes a Don’t Come Bet and a total of 4, 5, 6, 8, 9 or 10 is thrown on the roll immediately following the placement of the Don’t Come Bet, the player has the right to make a Supplementary wager in support of the Don’t Come Bet. The Supplementary bet can be any amount up to the allowable limit as set by the table rules just like the Supplementary Bet after Pass Line Bet. The pay out schedule for winning Supplementary Don’t Come Bets is the same as for Supplementary Don’t Pass bets. There are a few other bets like Big 6 and Big 8 which sound good on the surface, but really have a high casino advantage and should always be avoided. Proposition bets in the center of the table where you are betting the next roll will be a specific throw are often referred to as sucker bets and should always be avoided. This strategy will involve only the Pass Line bet and Supplementary after Pass Line bet. These wagers are all you need to know about to win big and consistently with this powerful strategy. When you walk up to a Craps table and find an open spot you will want to put your buy in money down on the table on the outside edges of the playing field and ask the dealer for change. Wait until the shooter rolls if he/she is already set and about to roll. Also, wait until the dealer pays out to everyone from the last roll, before putting your new money on the table. If the Point has already been set and the shooter is trying to repeat the Point, wait before you place your Pass Line bet. Just look at the Point marker on the table. If it is turned to OFF, then the point has not been set. If it is turned to ON and is in a square next to one of the Point numbers, then the Point is set at that number and the shooter is rolling for a repeat. If you review the Pass Line bet explanation above, you should realize the Pass Line wager is closed on the table once the Point is set. You should actually wait until the point is made or the 7 is rolled before you even put your buy in money down. This way you get your change and then place your first Pass Line bet all at once in preparation for the next sequence. Your Pass Line bet should be placed directly in front of you on the Pass Line bar. Okay, now you have your buy in and have placed your first Pass Line bet. If the shooter rolls a 7 or 11 on the Come Out Roll you’re an automatic winner and are ready to place another Pass Line bet in accordance with your money management strategy. If the Come Out Roll is a 2, 3 or 12 (craps) you lose your Pass Line bet and should place another Pass Line bet, again following your money management strategy. If the Come Out Roll is a Point number (4, 5, 6, 8, 9 or 10), your Pass Line bet remains (don’t touch it) to give the shooter a chance to repeat the point. This is when you lay your Odds or Supplementary wager in support of your Pass Line wager. Review the Supplementary Bet after Pass Line Bet explanation above. Your money management strategy should take into account that in order to get the true or even odds pay out from the casino, your Supplementary wager must be placed in certain increments depending on which Point is trying to be made. The odds paid for the 6 or 8 Point is 6 to 5 and should always be placed in increments of $5. The odds paid for the 5 or 9 Point are 3 to 2 and should always be made in increments of $2. The odds paid for the 4 or 10 Point are 2 to 1, so in this case it doesn’t matter what increment you use. The Craps table operates at $1 increments, there is no change. If you don’t place the Odds bets in the increments described, then you will not be paid the even odds when your Odds bet wins. The casino will round down and pay you less than the true odds. Your Odds bet should be placed on the table directly in front of you, behind your original Pass Line wager and right outside the playing field perimeter. Now, you have your Pass Line wager out there with a Supplementary or Odds bet backing it up. If the shooter rolls a 7, you lose both bets. If the shooter rolls the Point number you win both bets, getting paid even money for the Pass Line bet and the specified odds for whatever Point was made for the Odds bet. If the shooter rolls any other number, ignore it, leave your bets where they are and wait for the next roll when the shooter will try again to repeat the point. Once you win or lose, place your next Pass Line bet or walk away, depending on your money management strategy. Identifying games of chance that have a very low house advantage should be the first goal of any strategist or advantage player. A good target is a house advantage of 2.5% or lower. You cannot change the house odds!